Most of us know what earthquakes are and the disastrous effects they can have depending on their magnitude, location of epicentre, population in that area, buildings and other industries, etc. 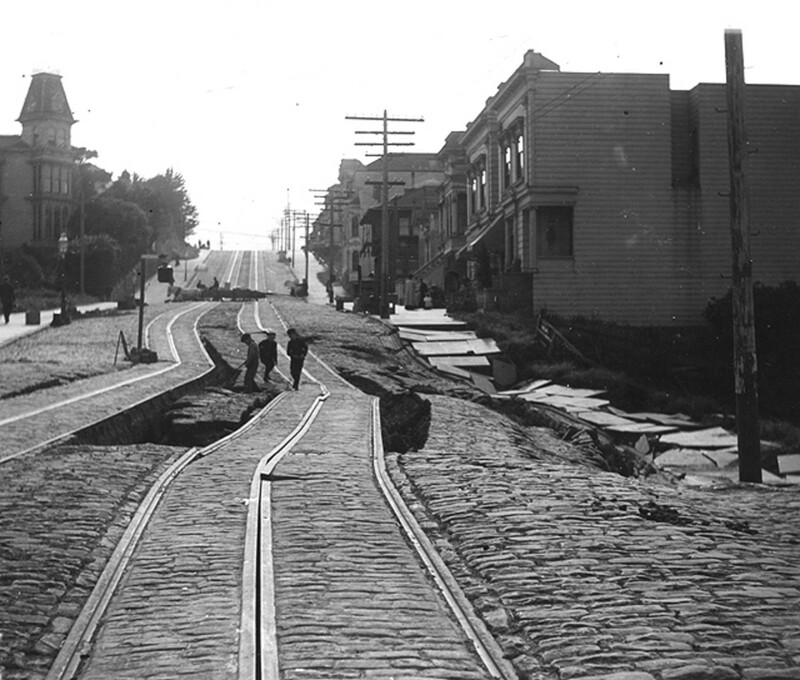 Before getting into details of the 1906 San Francisco earthquake, let us briefly look at what earthquakes are and how they occur. What is an earthquake? How do they occur? An earthquake is violent shaking of the ground or vibrations caused by rocks or blocks of earth or tectonic plates when they collide or slip past each other at a fault. The plane along which the movement takes place is called the fault plane. It can happen at any time during the day and at any day of the year. 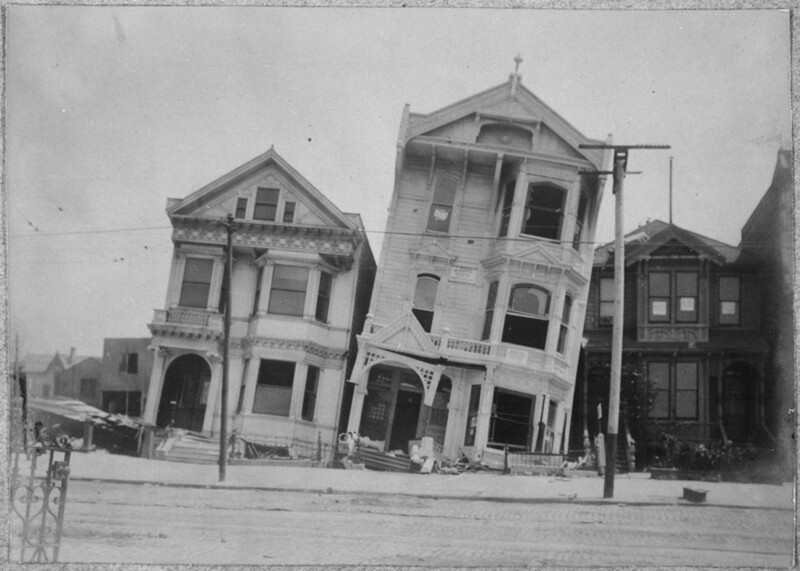 The 1906 San Francisco earthquake happened as a result of a rupture on San Andreas Fault. 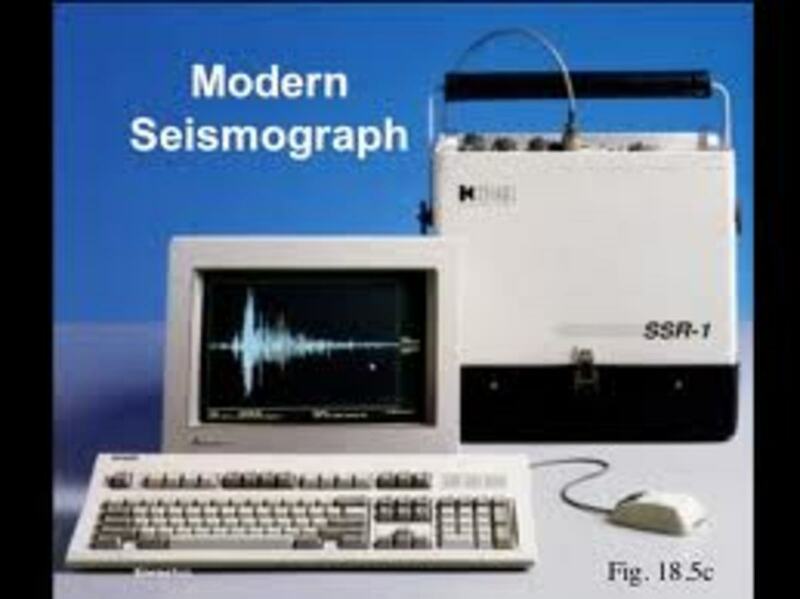 Earthquakes are recorded using seismographs and the recording is called seismogram. The Seismogram has a heavy weight hanging over a firm base. 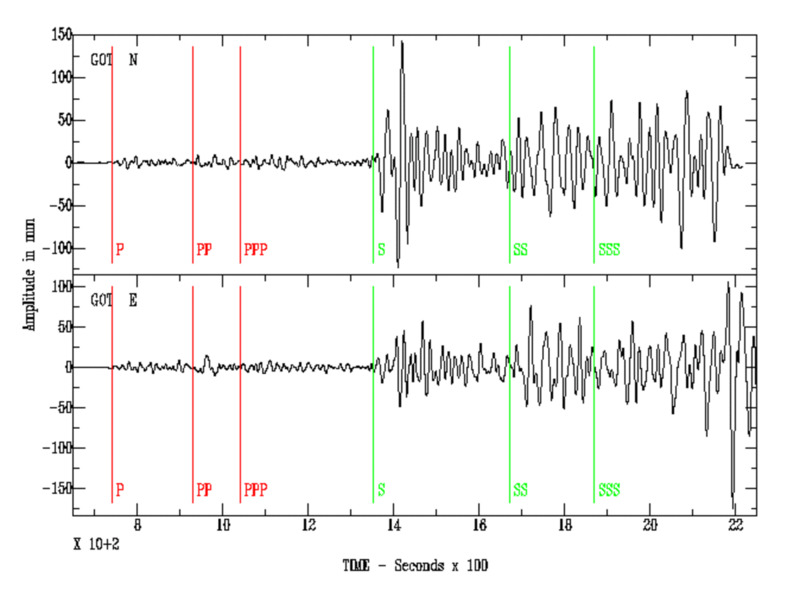 When the earth shakes, the base of the seismograph shakes, but not the weight and this difference between the shaking part and the stable part is recorded as seismograms. The size of an earthquake is measured from the seismogram and it is called the magnitude of the earthquake. 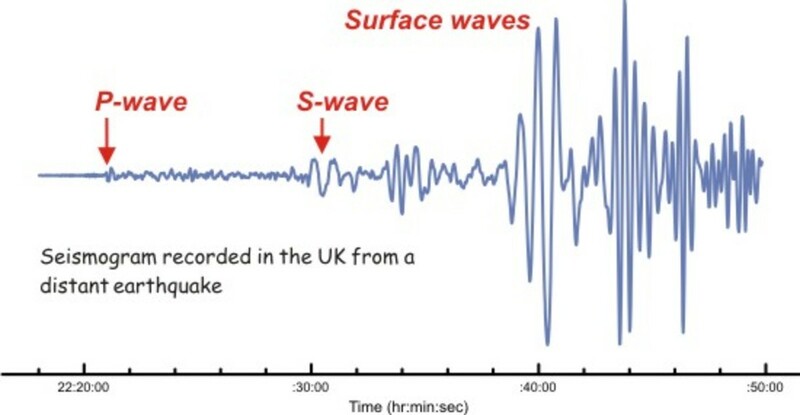 The magnitude is measured from the amplitude of the seismic waves recorded on the seismogram. 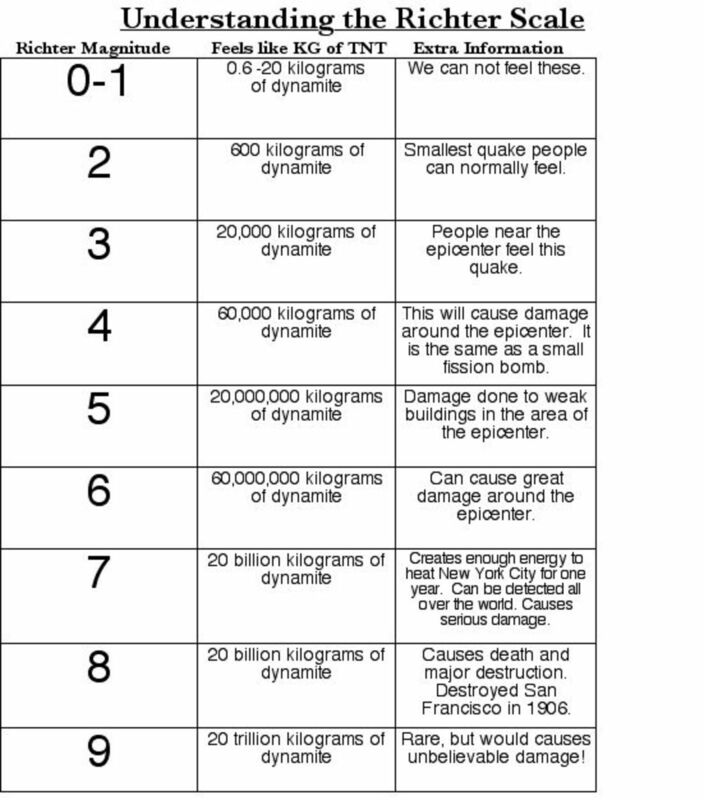 The intensity of the earthquake is also measured by rating them on a Mercalli Intensity Scale. 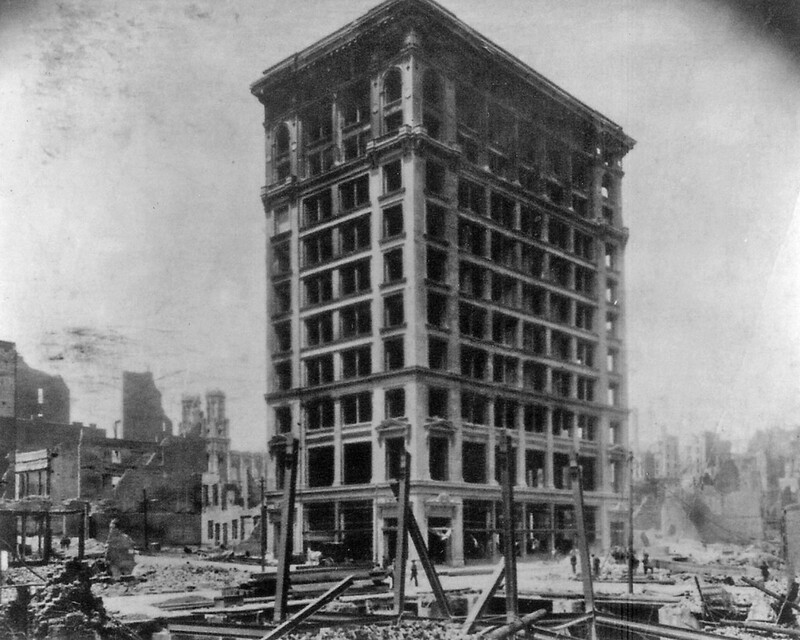 The 1906 San Francisco earthquake was recorded on a seismograph in Germany. In this video here, you might have a question as to how the hanging weight is stationary! It is due to Inertia. 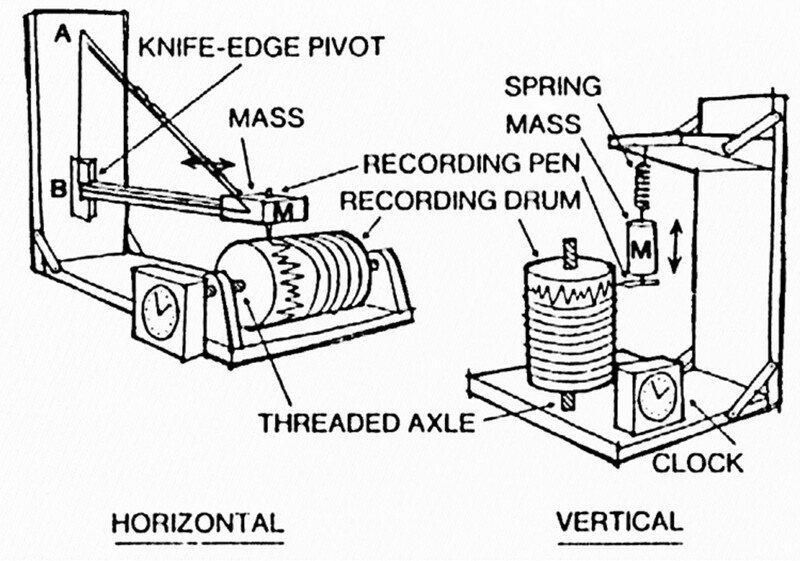 Inertia is the resistance an object has to the change in its state of motion. 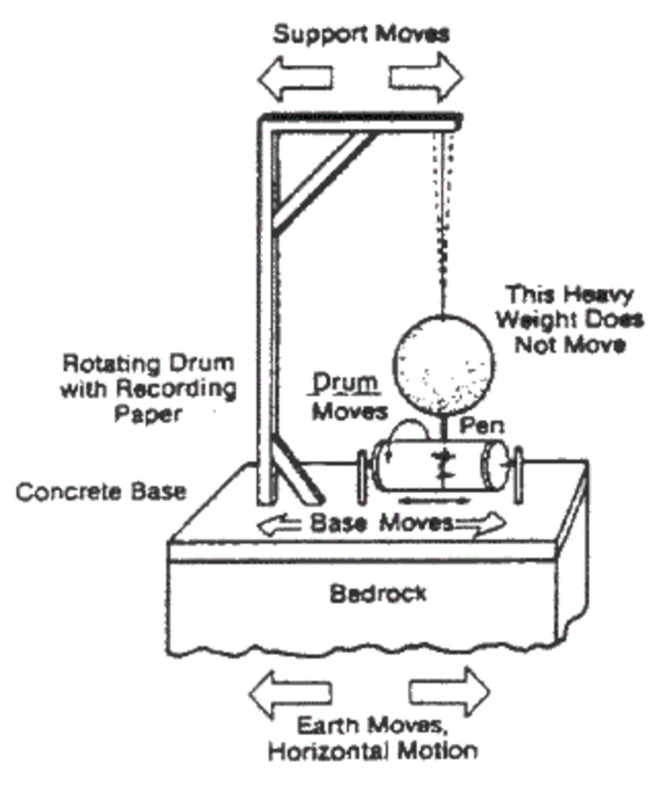 The video is only a demonstration of how a seismograph works and not a real seismograph. 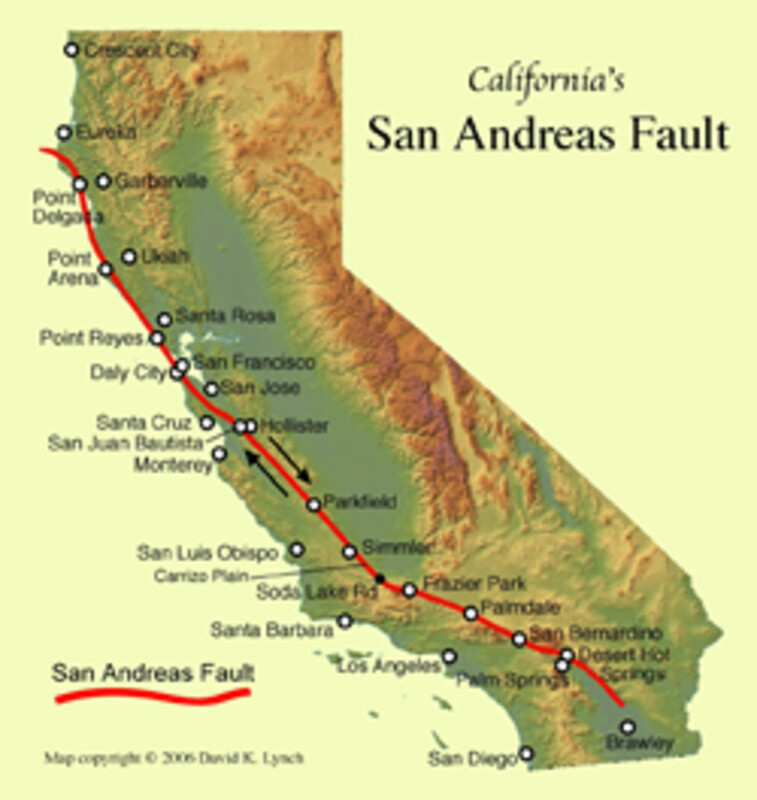 I have discussed San Andreas fault here briefly, as this earthquake was caused as a result of a rupture on the San Andreas Fault. San Andreas Fault is a continental transform fault and it forms part of the boundary between the Pacific plate and the North American Plate. Its length is about 800 to 810 miles and roughly ten miles deep and is the most famous fault (a planar crack in a rock along which slipping takes place) in the world. It extends from the Salton Sea in Imperial County to Cape Mendocino in Humboldt County. 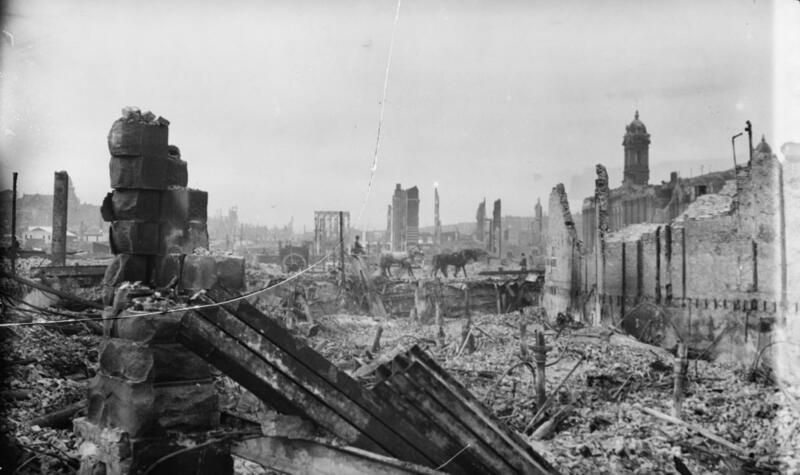 The 1906 San Francisco Earthquake is also called by other names seen below. 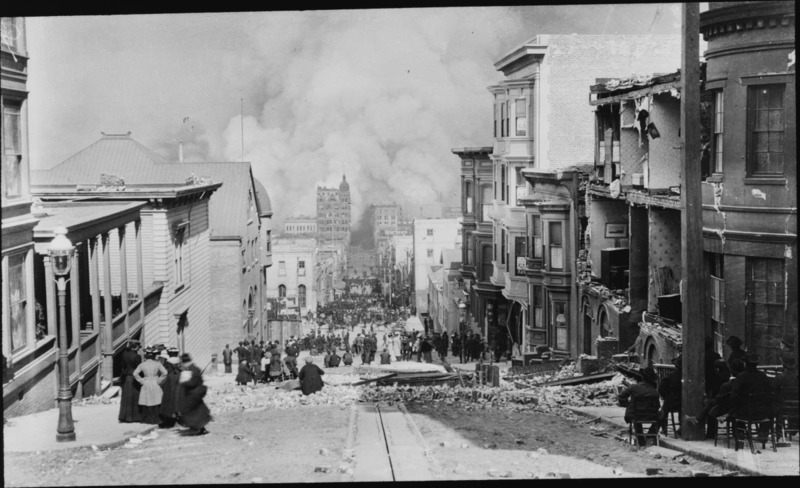 The 1906 San Francisco earthquake is considered to be one of the most significant and worst earthquakes of all times in the United States and is estimated to have registered 8.25 on the Richter scale. This earthquake occurred on the 18th of April, 1906 early in the morning at 5:12 a.m. killing nearly 3000 people (estimate only, real figure still unknown). 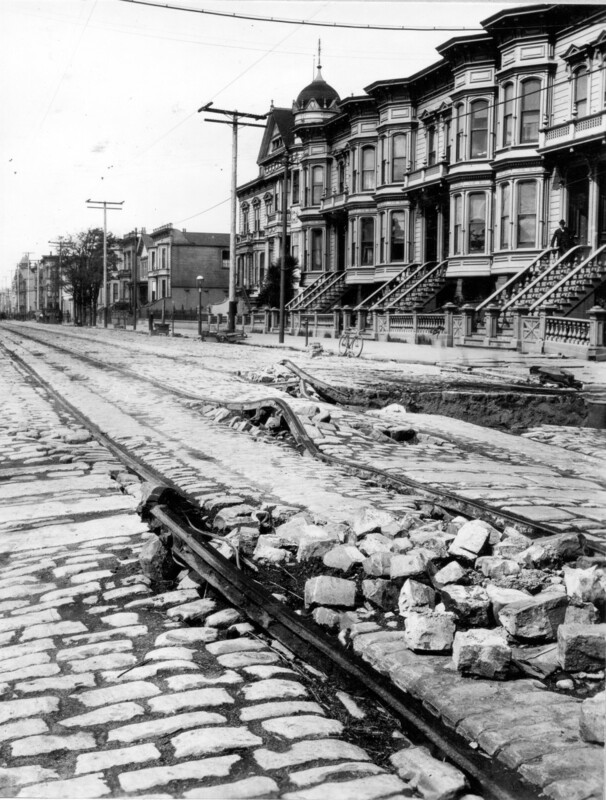 The damage due to the shake was severe in many places that were along the fault line rupture. 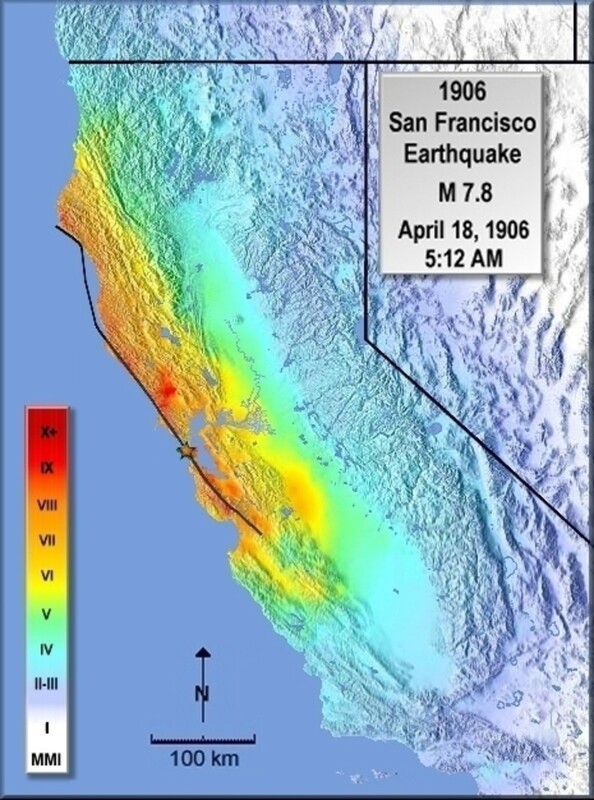 The epicentre of this earthquake was near San Francisco and a majority of the fatalities were in San Francisco while the rest were reported in the nearby areas. The greatest loss for life due to a natural disaster in California’s history. Insured losses were US$235 million that time (US$6 Billion in today’s dollars). 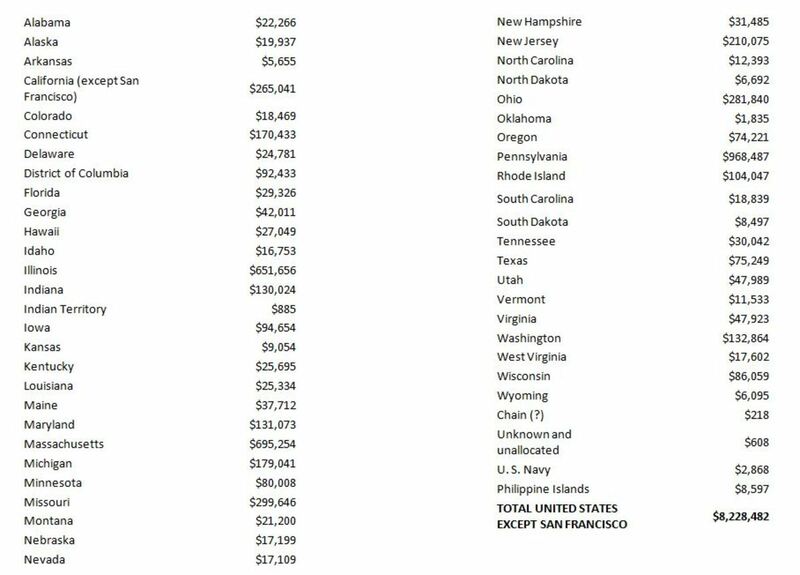 Besides San Francisco, cities of San Jose, Santa Cruz and Santa Rosa also saw huge destruction. The estimated magnitude of the earthquake is between 7.7 and 8.25 on the Richter. The rating of the quake on the Rossi-Forel Scale is 9. 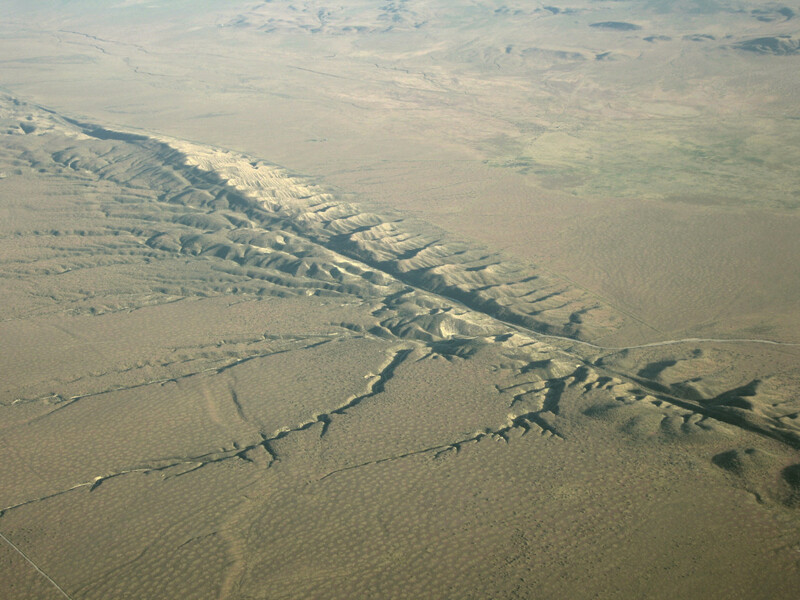 The earthquake was caused as a result of the rupture on the San Andreas Fault. 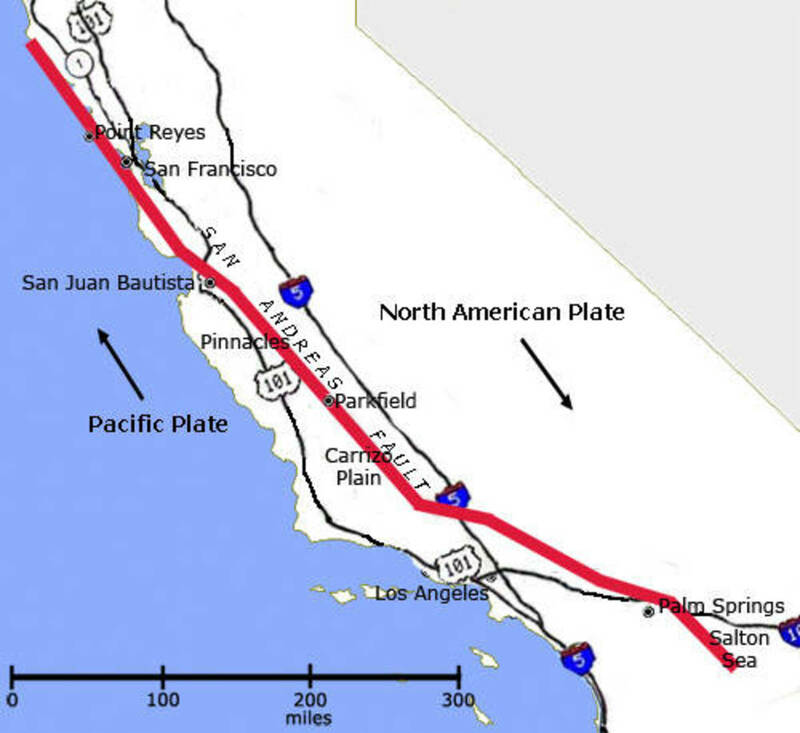 The length of the fault is about 810 miles and runs along the length of California from Cape Mendocino in the North to Salton Sea in the South. The rupture due to earthquake was along the northern region of the fault for a distance of about 290 miles and the surface displacement (offset) was about 20 to 28 feet (higher in the north 24-28 feet and lower in the south 8 -12 feet). 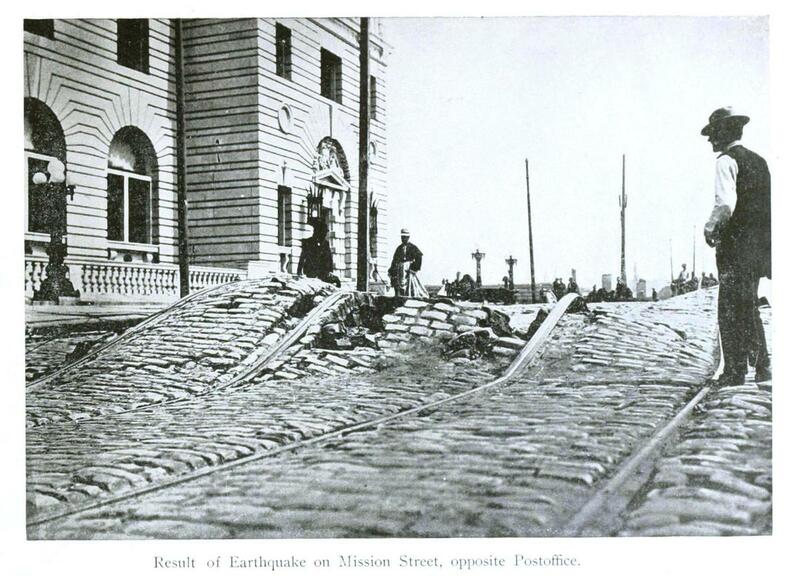 A strong foreshock occurred at 5:12 a.m. on the 18th of April 1906 and it was felt in the San Francisco Bay area. After 20 to 25 seconds this was followed by a great earthquake that lasted for about 40 to 45 seconds causing devastating destruction in San Francisco and surrounding cities. 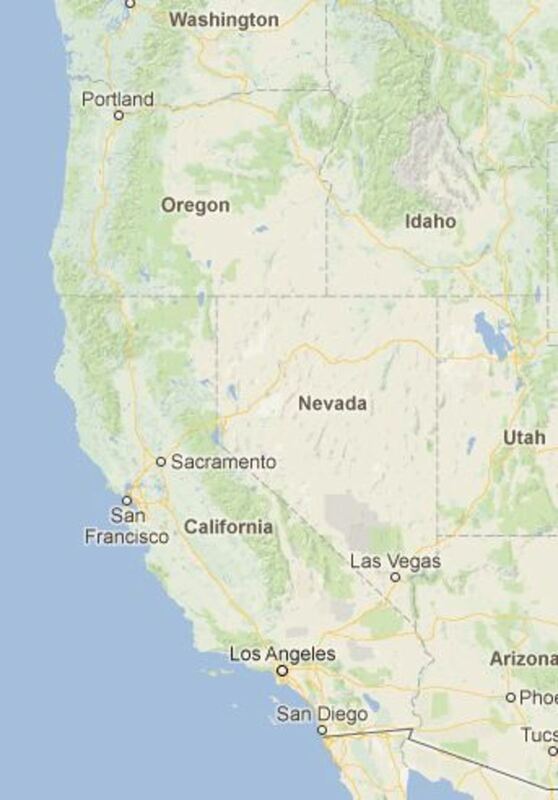 The quake was felt from Southern Oregon to South of Los Angeles and extended as far as Central Nevada internally. 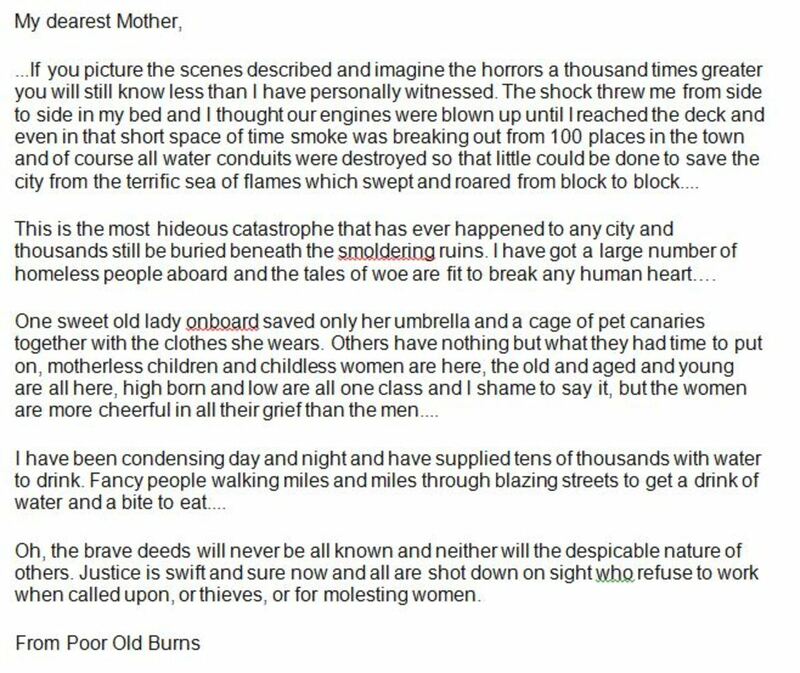 Buildings collapsed, gas, sewers and most water lines broke, chimneys broke and fell, and many people were caught under the debris of collapsed buildings as they were still in bed and did not have enough time to leave the buildings. 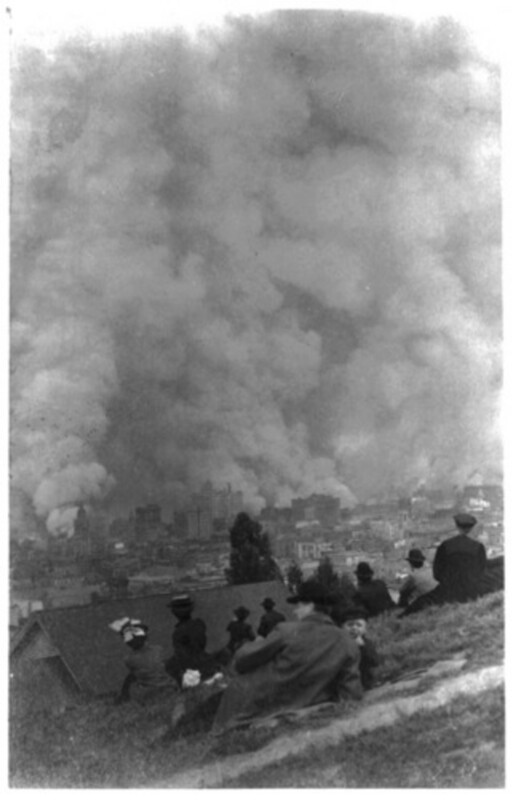 Broken gas lines led to fire that spread across the city of San Francisco. 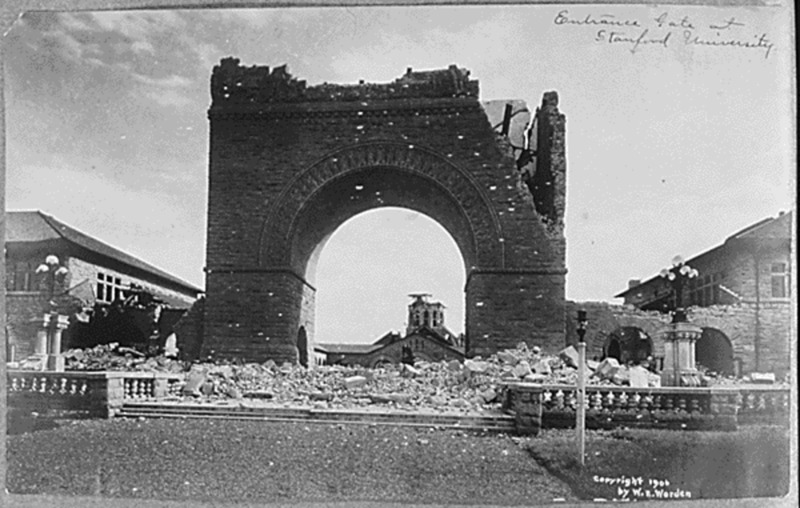 Brick walls collapsed and pavement were arched and fissured. Trees fell to the ground. The fire Chief Dennis T. Sullivan was also a victim of falling debris. 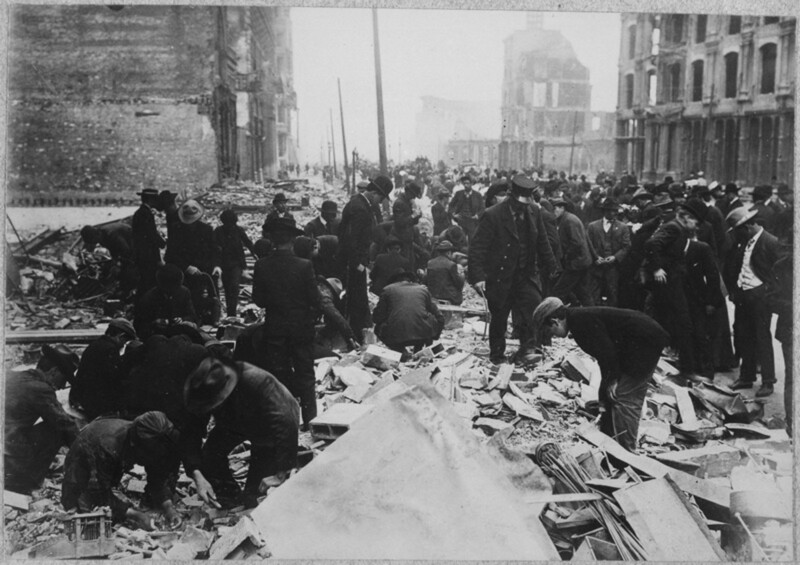 Streets, railway lines and other facilities were destroyed and the whole city was reduced to rubble. The damage caused by the fire was more than that of the quake. There were many aftershocks, in which some of them were severe. 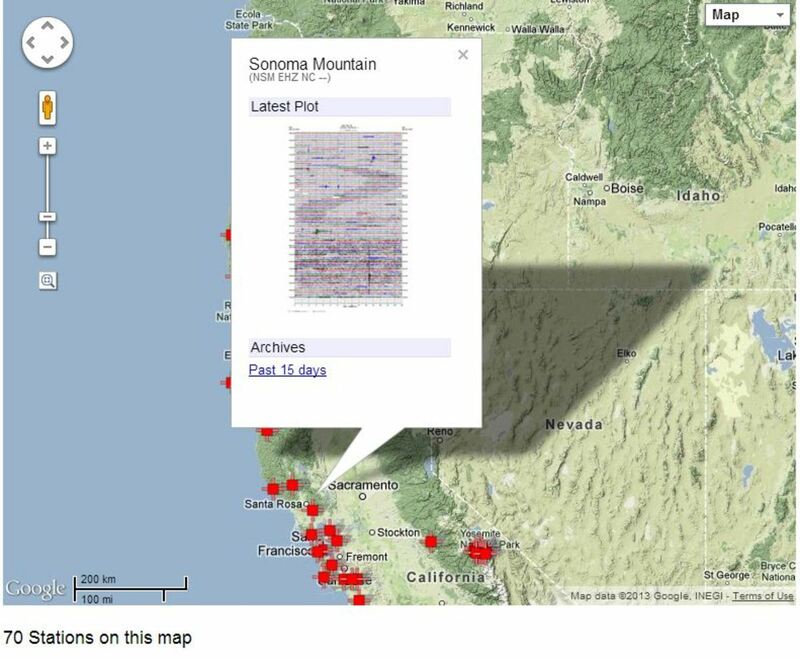 Recent analysis by the United States Geological Survey (USGS) show that the epicentre was near Mussel Rock on the Coast of Daly City which is to the South of San Francisco, evidenced by a tsunami recorded by a tidal gauge at the San Francisco Presidio. More than 30 fires broke out due to rupture of gas mains and they burned uncontrollably destroying 28,000 buildings (500 blocks), which account for more than 90% of the destruction due to earthquake. 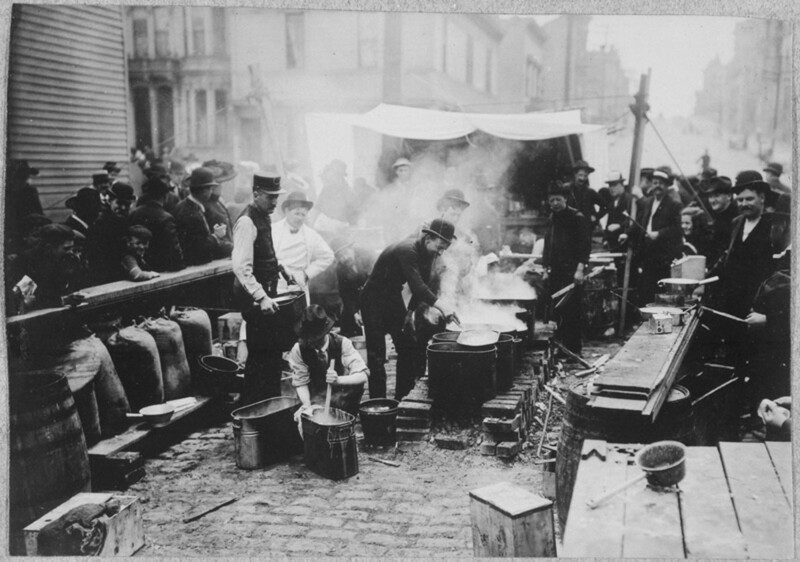 One of the largest fires was started accidentally in a house when a woman was preparing breakfast for her family and it is called the “Ham and Eggs Fire.” This fire burned for 24 hours and destroyed a 30 block area. 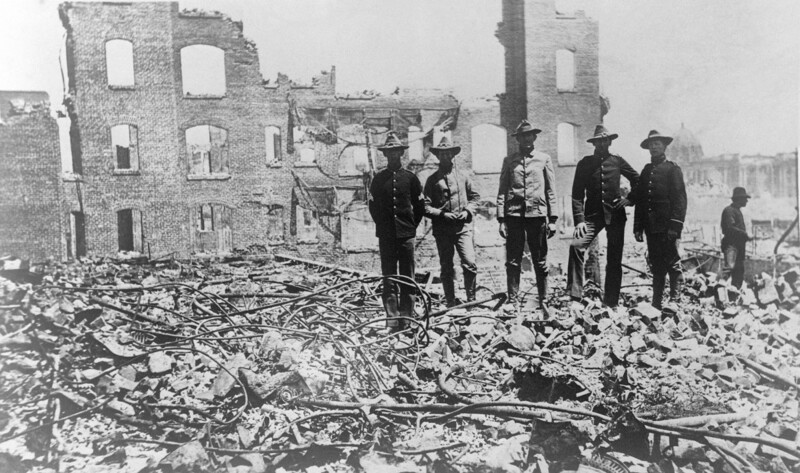 Many fires were started by fire fighters who were not trained in the use of dynamites. 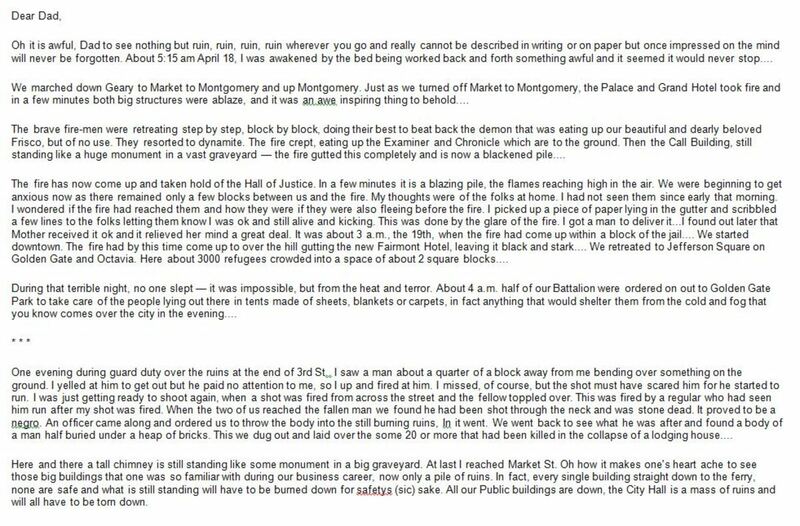 They used the wrong dynamites and a result of that fire broke, when they were trying to demolish buildings to bring fire under control. This helped the fire spread and caused more than 50% of the building damage. The fire fighters did not have the required supply of water to put the fire off as most of the water mains were broken. Many scientific laboratories got burnt in the fire. 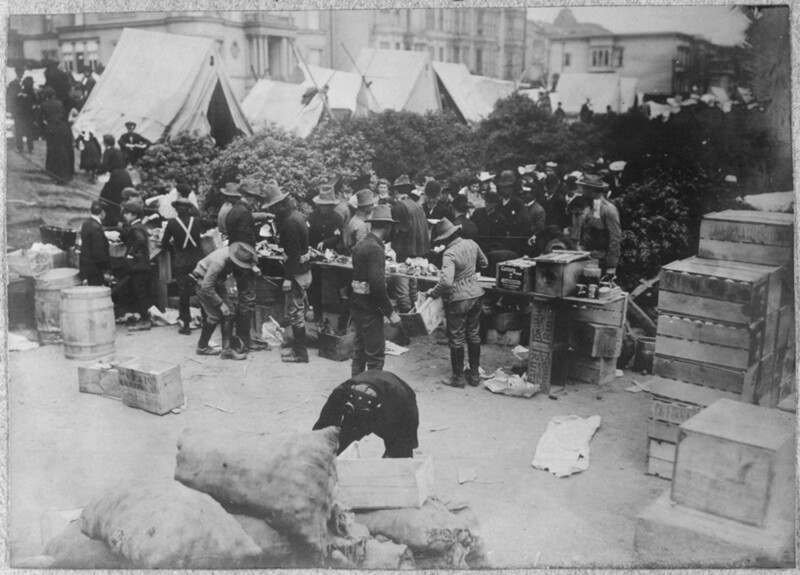 The United States Army played a major role in protecting valuables and guarding buildings. 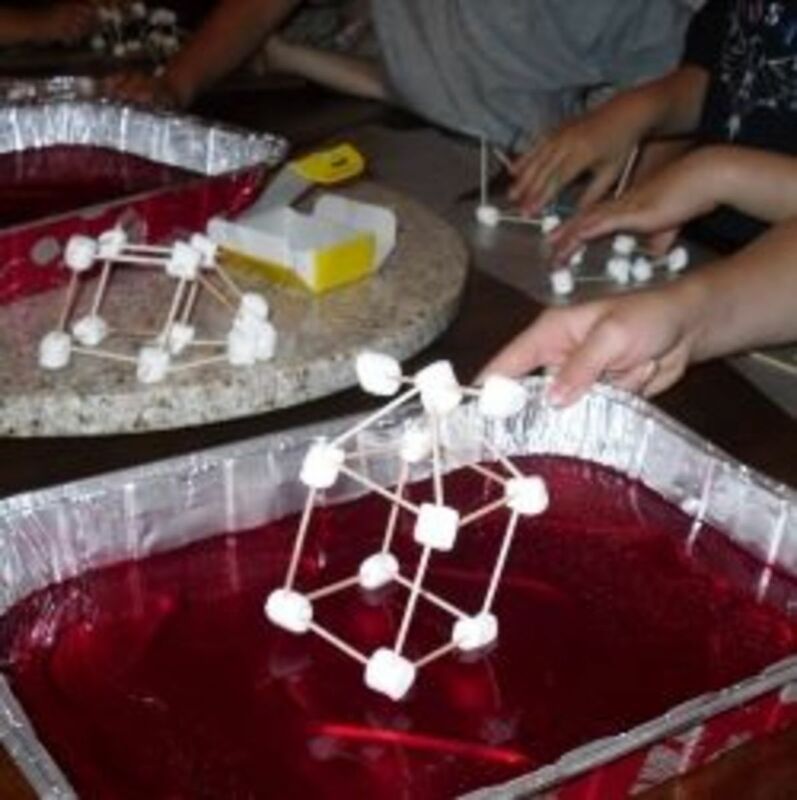 They also helped the fire fighters with setting up dynamites to demolish buildings. They helped with feeding, sheltering and other help for the survivors. 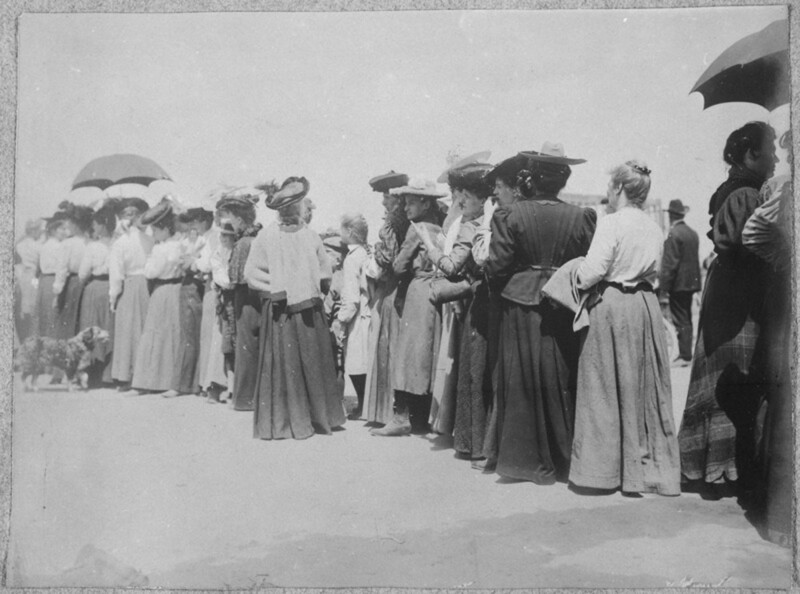 Thousands of people were using ferries to cross the bay and move to nearby cities. 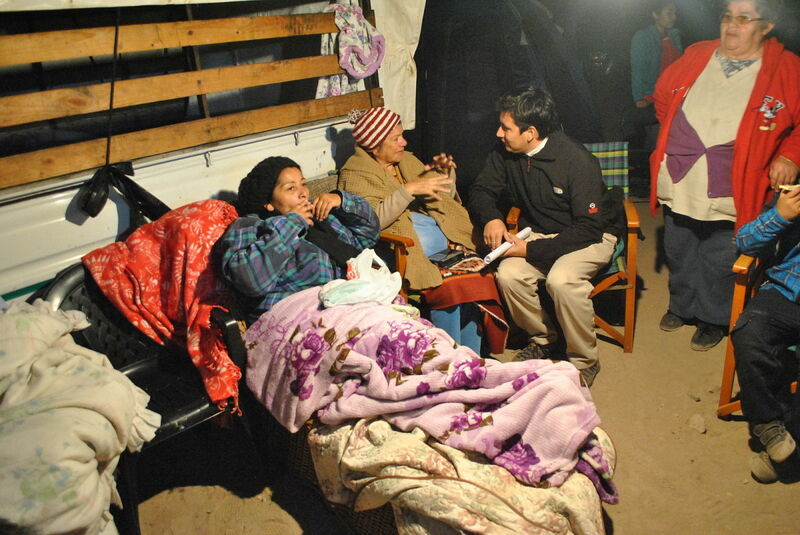 More than 5000 relief houses were built that accommodated 20,000 people who were displaced. These houses were rented till their houses were rebuilt. 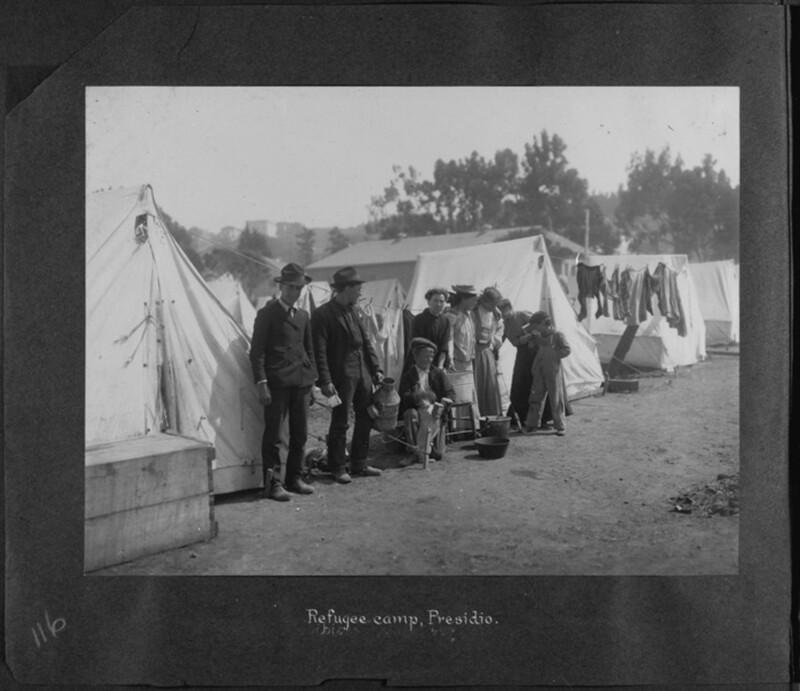 Most people moved out within a year and the refugee camp was officially closed on the 30th of June 1908. Reconstruction plans were immediately drawn to rebuild the city. 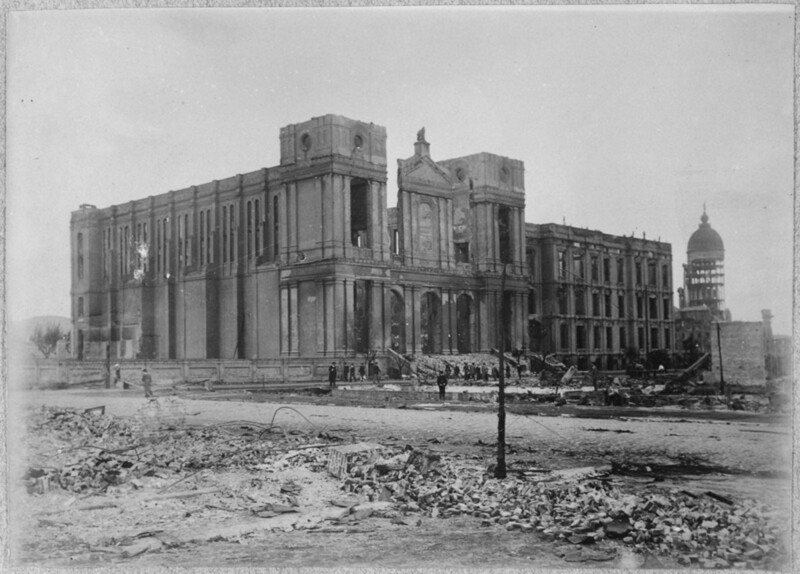 American Psychologist William James, who was teaching at Stanford at that time, visited the quake site and was impressed by the positivity of the survivors, which he later mentioned in his book “Memories and Studies.” So many other people have also mentioned the fact that the survivors were very positive about the reconstruction of San Francisco to be larger and better than before. The Chinese population and other poor populations were attempted to be ridden off, but the Chinese rebuilt Chinatown to a modern one. 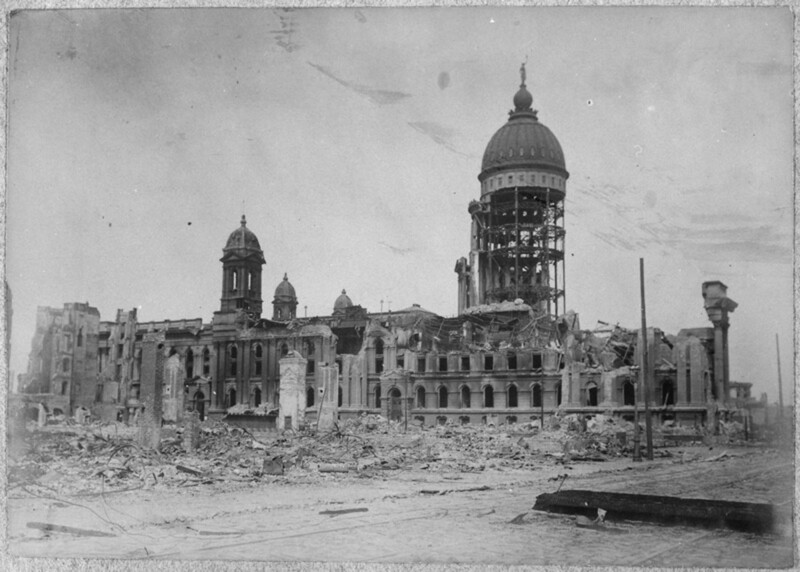 Thousands of Chinese immigrants were able to claim residency and citizenship as their papers were all lost in the quake and fire as the City Hall got completely destroyed. 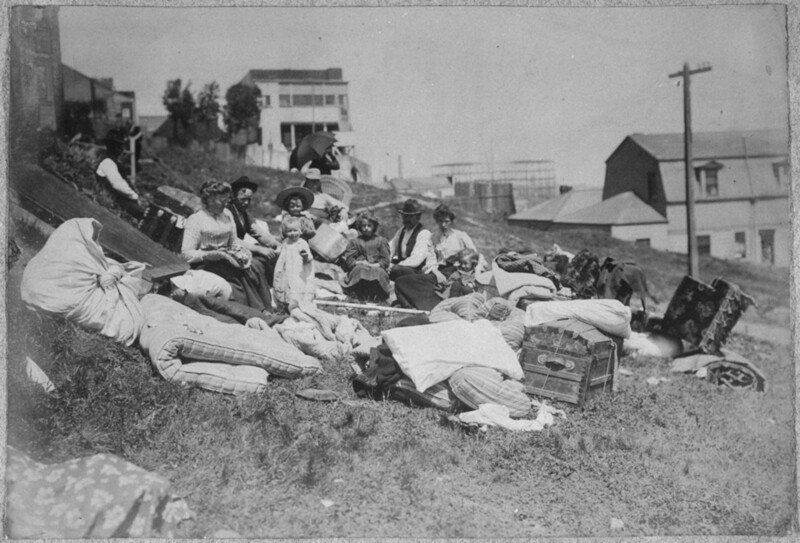 Nob Hill was a wealthy area and the mansions in that area were almost completely destroyed in the earthquake, and hence the residents moved to the west where there were cheaper lands and better weather. 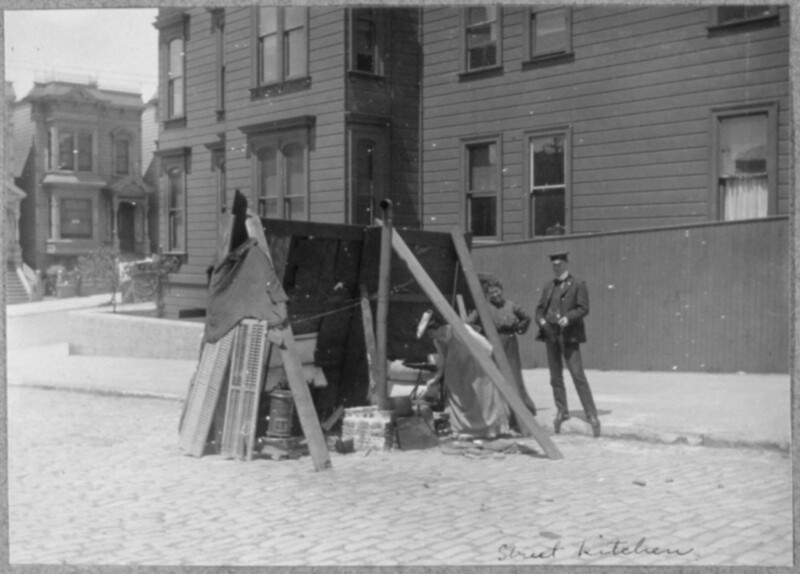 This also led to the development of the Pacific Heights. Mansions were constructed and most of them were completed by 1915, ready for the Panama-Pacific exposition. It also celebrated the reconstruction of the city and since then the city memorialised the disaster of the quake at the Lotta’s Fountain (meeting point during disaster where people came searching for loved ones and to exchange information). When the news of this disaster spread all over the world, different countries sent in money for relief work. Even individual citizens and companies contributed towards this. Although it was not enough to get people back to their feet, it helped in some way to provide daily meals for them and build some tents. 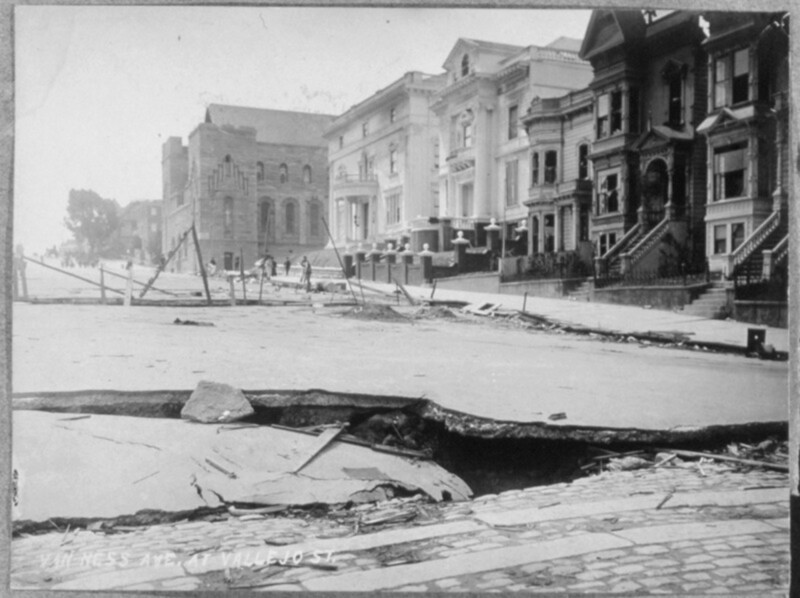 This quake was the first worst natural disaster in the world to be recorded as photographs. 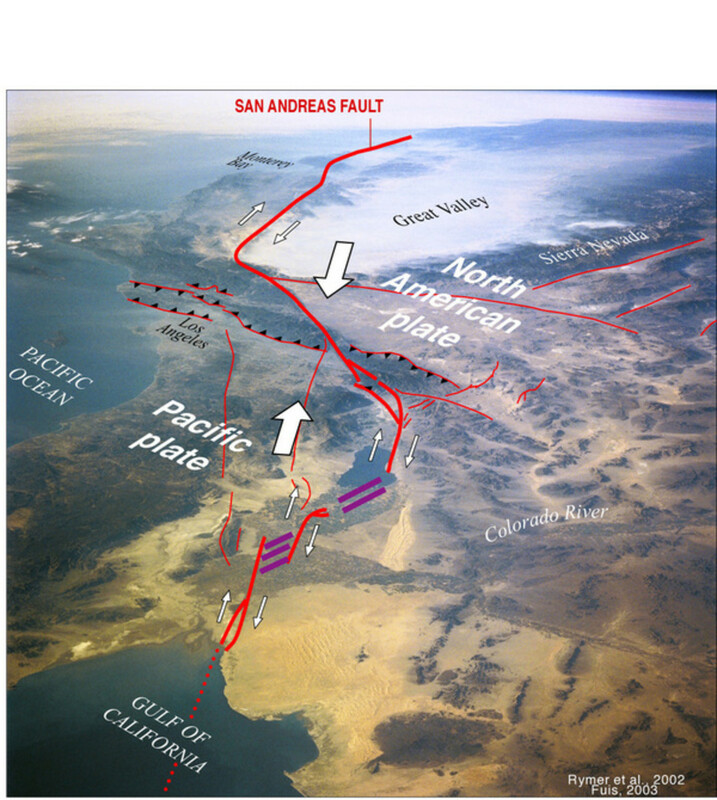 This quake led to the in depth study about the San Andreas fault, which was least known about before the quake, and also led to modern earthquake science in the United States. For example there are Real Time Seismographs available from the U.S. Geological Survey department on the internet for people to have a look. 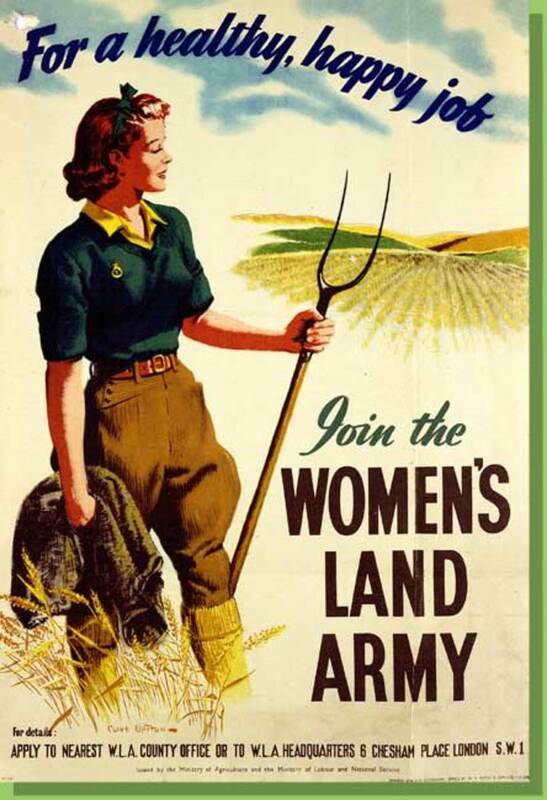 They even have archives (please do have a look). 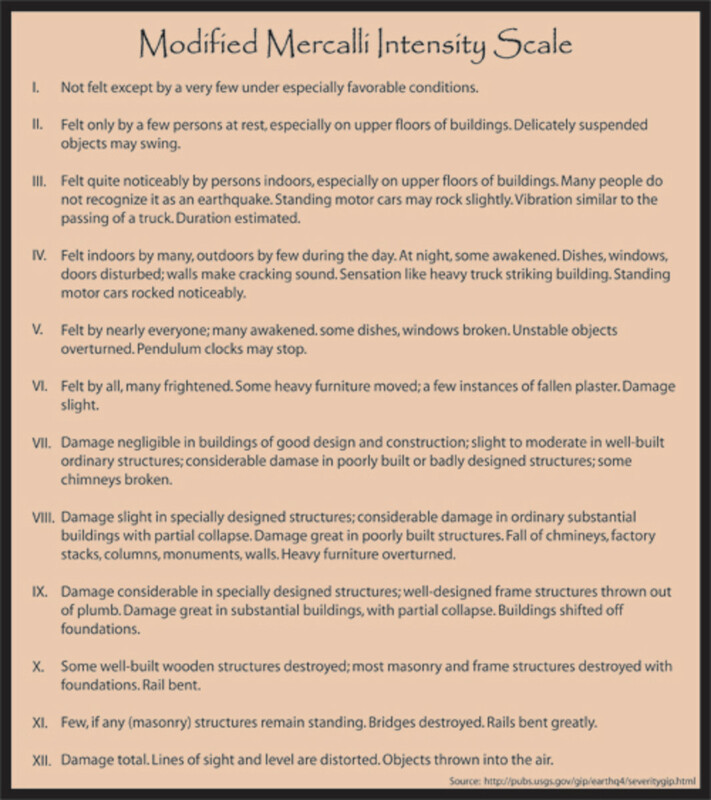 According to the USGS website, the intensity of shaking of the earthquake was so high that it did not fit into the Mercalli Intensity scale and so it had to be revised later as Modified Mercalli Intensity scale (MMI scale) with 12 increasing levels of intensity, for this earthquake to fit in. The earthquake permanently shifted the course of Salinas River in Montrey County near its mouth, diverting it 6 miles to the south. More than 90% of the damage was due to fire in buildings that burned for four days and nights. Since properties were insured for fire damage and not for quake damage, many residents set their quake damaged properties on fire intentionally, in order to be able to claim for insurance. 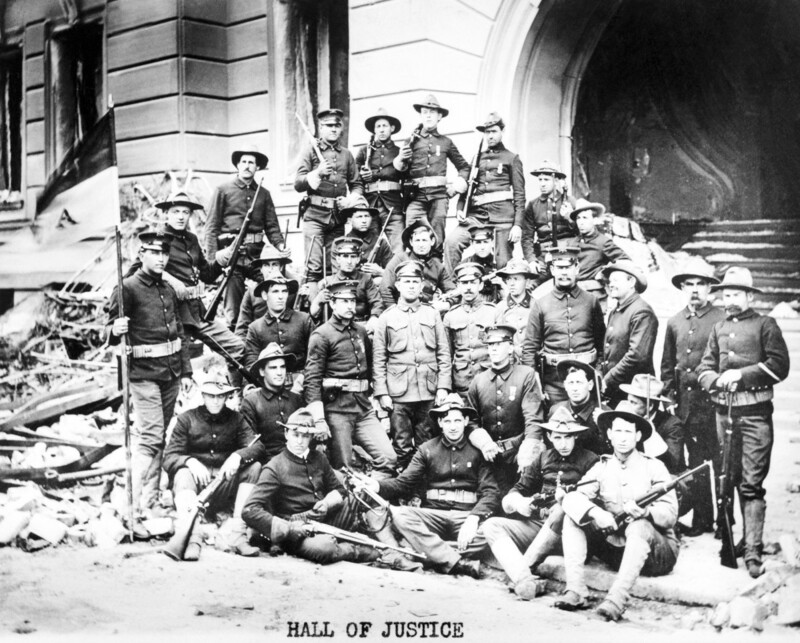 Mayor Schmitz requested all available troops to be sent to the quake site and they all assembled at the Hall of Justice by 7:00 a.m. 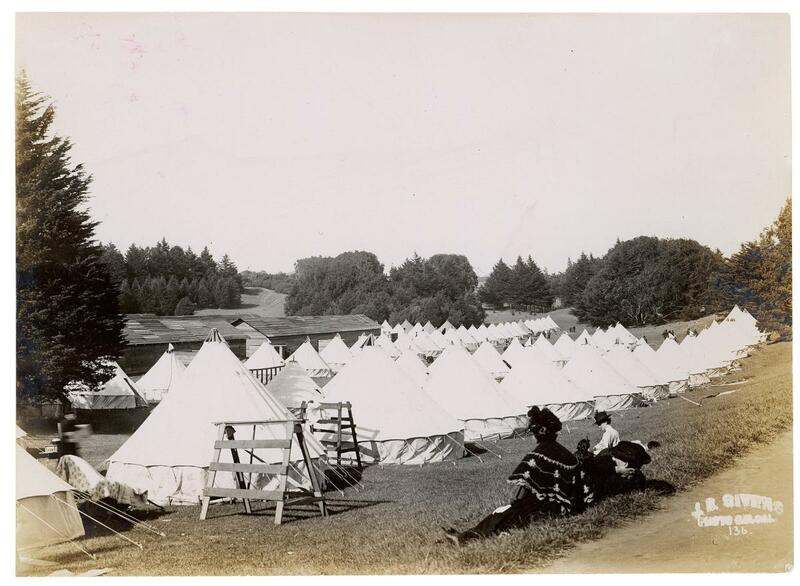 There were a total of 1,700 troops who remained there for 10 weeks maintaining hold on security. 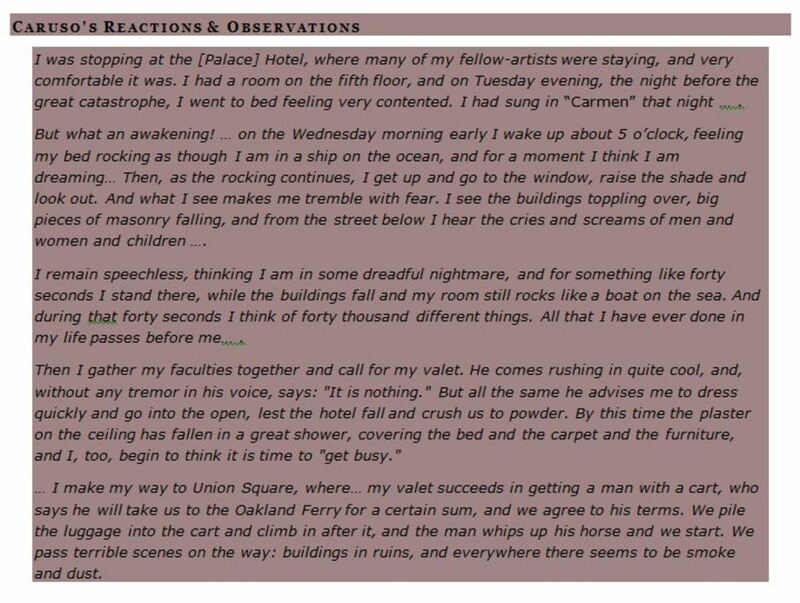 After Tenor Enrico Caruso’s performance of Don Jose in “Carmen” the night before the quake at the Grand Opera House in San Francisco, he woke up to a great tremor that morning and fled the hotel. Alice Eastwood, the Curator of Botany at the California Academy of Science, entered the burning building and saved nearly 1500 specimens of a newly discovered rare species of plant before the laboratory was completely destroyed by fire. He was later credited for that. 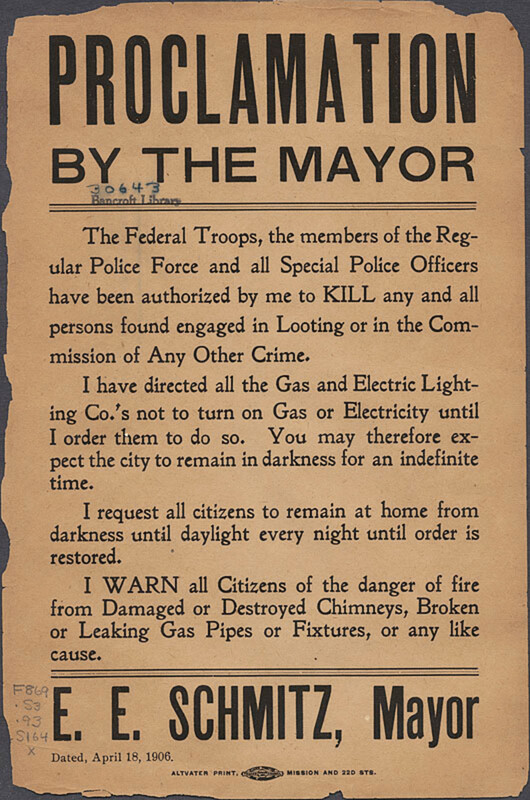 Due to excessive riots, Mayor Schmitz issued an order of Authority to the Police Force to kill people involved in plundering or any other crime. Scientists walked the entire length of the earthquake rupture (even through the poison Oak trees) to study how much the faults had slipped. 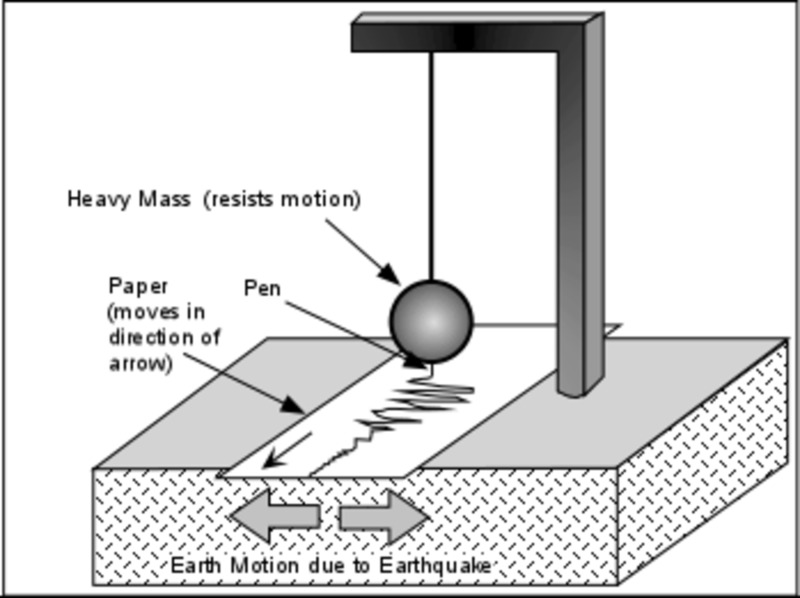 Prof. Henry Fielding Reid, Professor of Geology at John Hopkins University used above observations and formulated his elastic rebound theory (gradual accumulation and release of stress and strain) which is the principle model for the occurrence of earthquakes. I hope this has been useful. Please feedback if there are any errors as these figures were collected after a lot of research. I would also like to hear your thoughts and experiences if any. Thank you for passing by. I am glad that this hub was useful for you. Thank you for your feedback and votes. Have a great 2016! I've heard of the San Francisco earthquake of course, but for some reason I'd always thought it was a fairly small-scale disaster. This has really opened my eyes! Great Hub, thoroughly researched and well written. Voted up. Hi Epigramman, thank you so much. I am so pleased that you found this interesting. 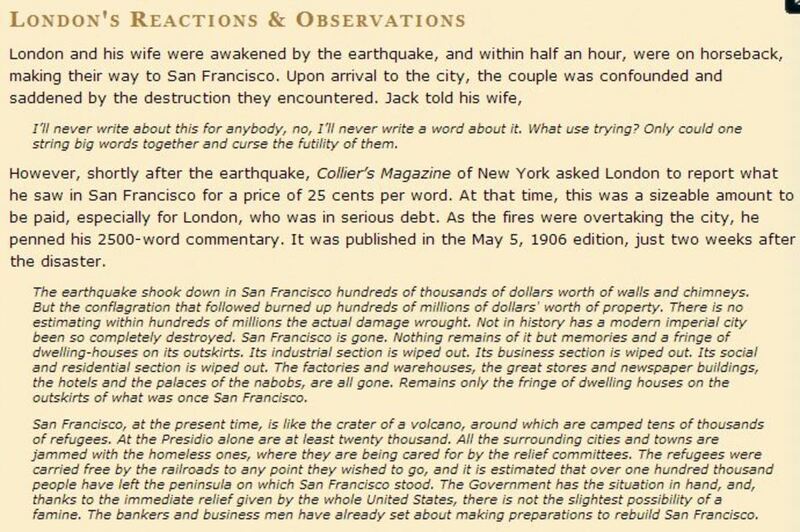 It was great to research and write about a historic earthquake. So many facts and information to learn and know. Thank you for the share. Like HUBWOWWWWW!!!!! 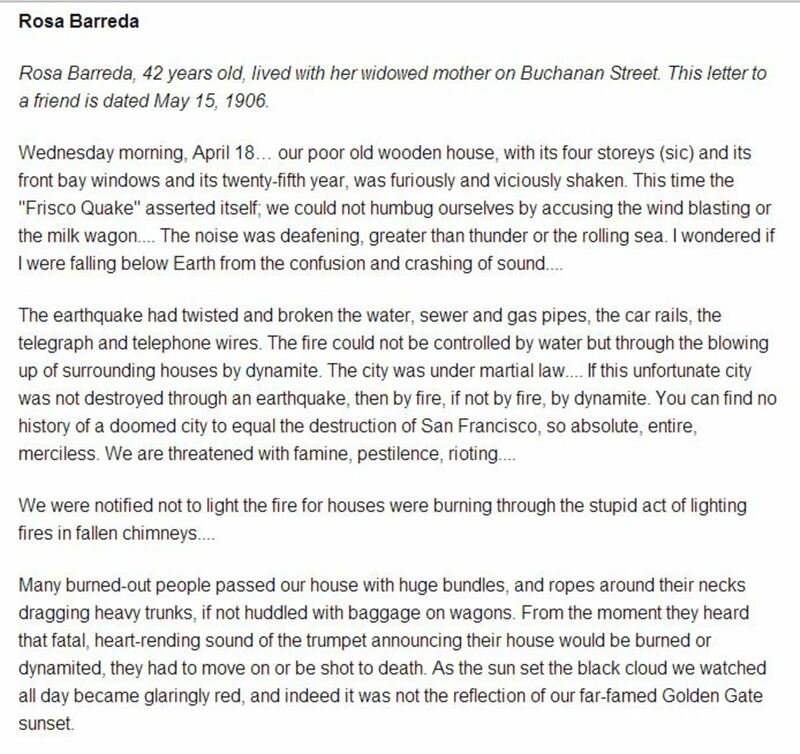 This has to be the definitive statement on earthquakes and also a look at a very historic one too. 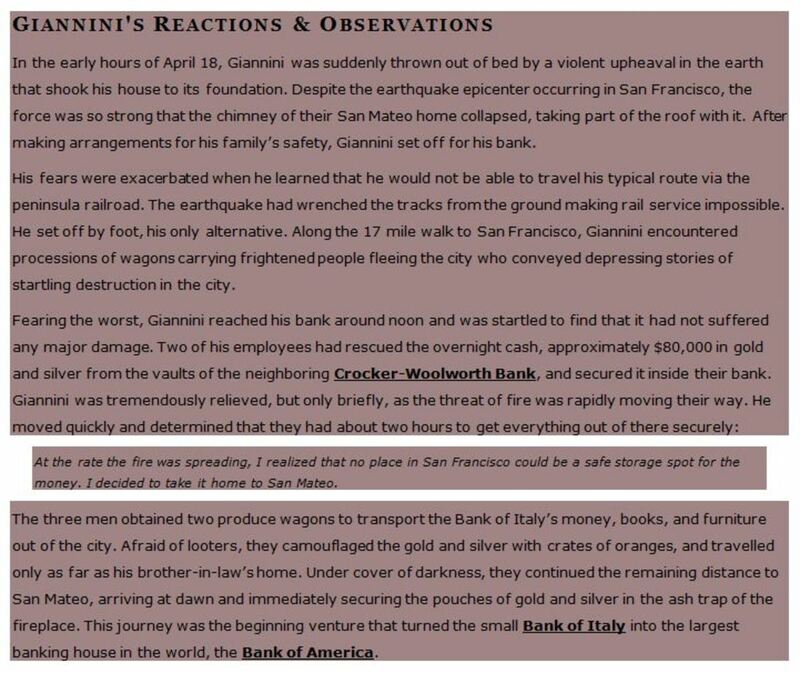 I love how to you explain them from a technical standpoint and then describe the one in San Fran. Excellent use of images and videos and this world class hub presentation truly deserves a honored spot on the Louvre Hall wall of fame in the non-fiction gallery. Hugs and blessings, have a great week ahead! Hi livingsta... what a fact filled hub this has been to read. Thank you for all your hard work. I have only had one experience in an earthquake and it was enough for me. I think I will stay on solid ground... smiles. Hi Elias, thank you for reading, voting and sharing. I am pleased you liked it. Have a good day! Very good article, voted up and shared. Hi Debbie, thank you for reading and I am pleased that you found reading this interesting. Thank you for your appreciation. Have a good weekend! Hi Arun, thank you so much for reading and appreciating. I am pleased that this hub has been interesting to read and detailed. Also thank you so much for sharing! Have a great weekend! Hi Mike, thank you for reading and appreciating. I am pleased you liked it. Have a great weekend! 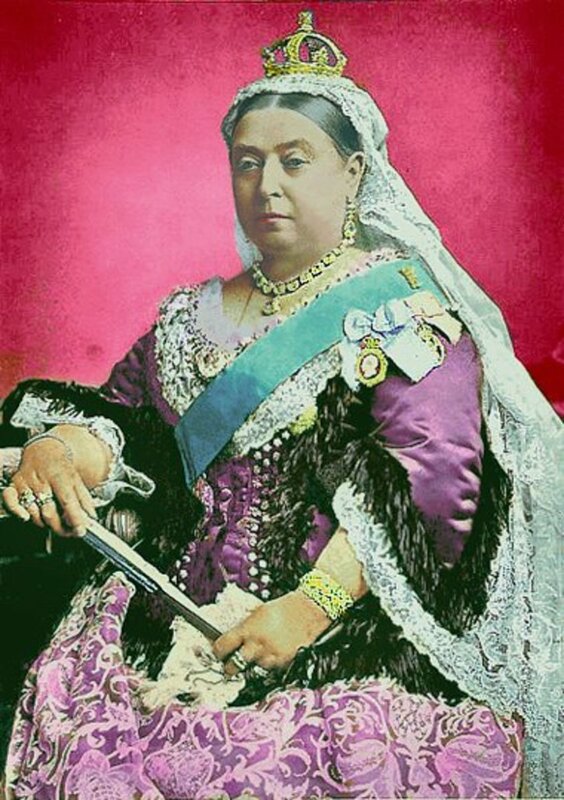 I love historical posts that shed light on events that marked history; what is more, your post was really informative and well writenn. Congrats. Hi Joanveronica, thank you for reading and sharing your experience and thoughts. Also thank you for sharing this hub. Have a great day! Hi Marcy, thank you for reading and sharing your thoughts. I am glad you liked this. Have a great day! Hi Daisy, thank you so much for reading and appreciating. I am pleased you liked it. Have a good day! Hi Michelle, so true. I could feel what people would have gone through while writing this hub. Thank you for reading and sharing your thoughts. Have a good day! Fantastic article! 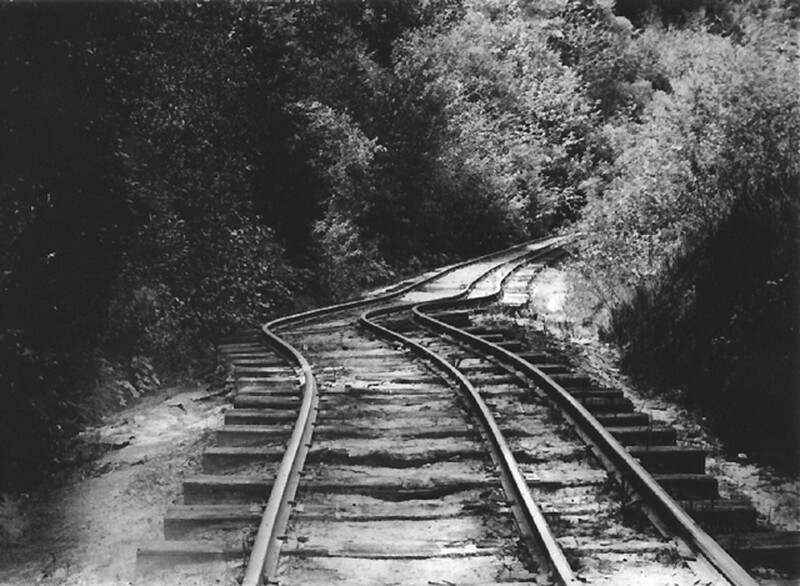 I knew about it because it also affected Valparaiso Chile when my grandparents (British grandfather) were living there. Shared! Earthquakes are really fascinating to me - the movement of enormous plates of earth, or the uplift of sections, all those ways of creating these acts of nature are just - fascinating. We are so small, and the earth is so huge. Great topic! Only a physicist could have explained the technical details of earthquakes the way you did, my friend. Well done! Thanks for all the time you spent in researching and writing this excellent article. Natural disasters like these are so traumatic and life changing...and it takes so much time to get over the obstacle. Thanks for sharing!! Hi Mr Archer, thank you for reading and I am pleased you found this interesting. I did look up for the New Madrid quakes and it looks like a series of quakes that happened over a period of time. I have not heard about the earthquake app, interesting to know. I will have a look. Terrifying to hear about your experience. I can imagine what you say. Have a great day and thank you so much for the votes! Very thorough and interesting. I myself am interested in the 1811 - 1812 New Madrid Quakes. I actually have an earthquake app on my iphone, and on my laptop. About 18 months ago I had the unique experience of being awakened at a bit after 10:00 PM to a hum, or growl that was more heard than felt. It turned out to be an earthquake in central Oklahoma, about 100 miles away. If I felt that small quake, when the New Madrid wakes up my city might be hopping like crazy! Voted up and interesting. Good job. Thank you Gable, I am pleased you liked this. Thank you for the votes. Have a great week ahead! Hi Pstraubie48, thank you so much for reading and sharing your experiences and thoughts. I am pleased this was interesting read for you. 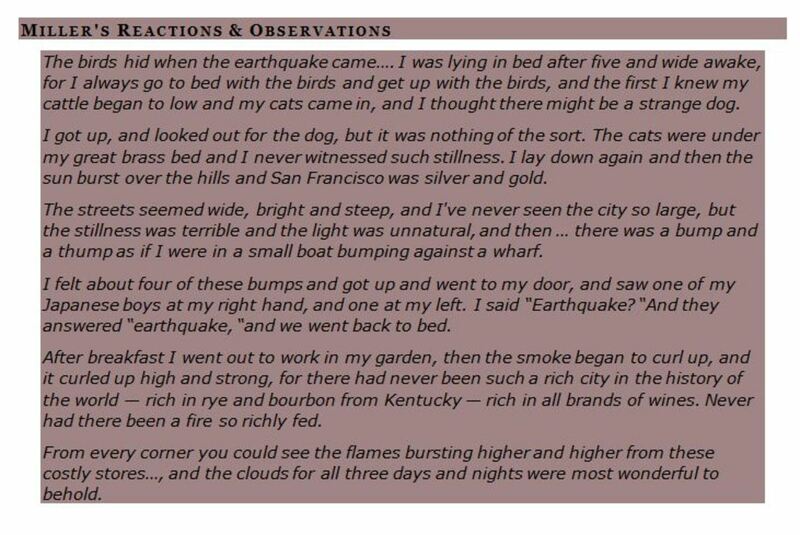 I can imagine how you feel about the earthquake reports. Sending angels to you too. It was somewhat surprising to me that the deaths were not reported as they actually were at the time. this was very interesting to read and to learn of the many facts I did not know. 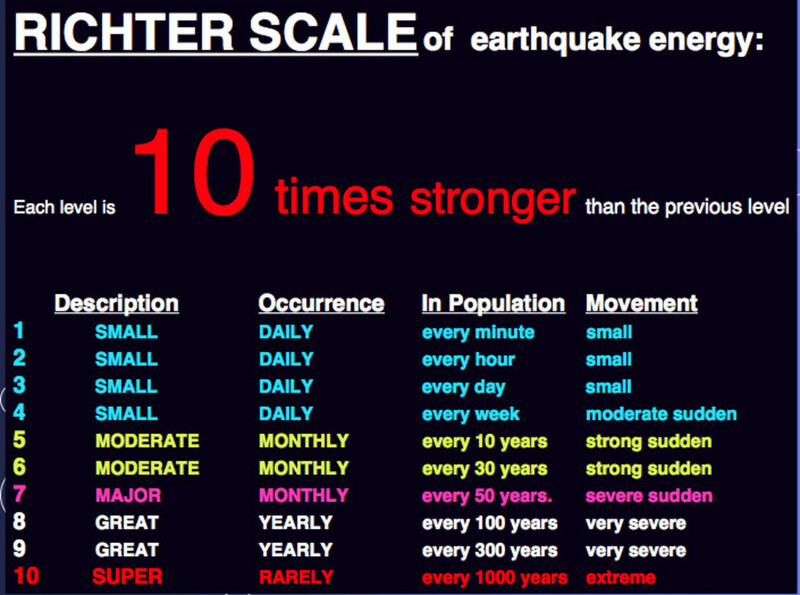 We lived in Japan and earthquakes were frequent---not huge ones but enough to rattle us out of bed at night. And they kept reporting that a big one was on the way any day. Of course it happened 30 years after we left but the thought of that big one was stashed away in our minds. Hi Suziecat, thank you for reading. Yes unbelievable!!! I am pleased this was interesting for you. Have a good day! Hi Appsthatpayyou, thank you for taking the time to read and share your thoughts.It is indeed a very sad incident. Also thank you for the appreciation, votes up and share. Have a good day! Excellent Hub. I can't believe the mayor would issue an order to kill despite the chaos. Thanks for the interesting read.